Doomseeker can be downloaded at the home page and SVN binary builds are also available. 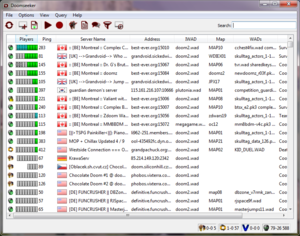 Doomseeker is a multiplatform server browser that initially supports nearly or all of the major multiplayer Doom ports. Doomseeker is an official server browser for Zandronum, and has officially replaced the Internet Doom Explorer (SkullTag Edition) or IDESE server browser. Furthermore, as Doomseeker is still escalating with new and improved features, Doomseeker's support and functionality continues to grow on every release. Despite that other server browsers are present, Doomseeker is currently the only majorly known server browser to work on crossplatforms. Doomseeker prompts the user to check the settings when executed for the first time on the system. 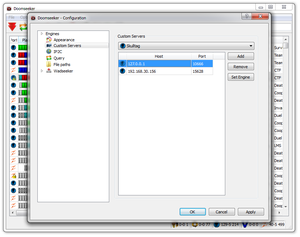 When Doomseeker runs on a system for the first time, Doomseeker will prompt the user to check and also configure the settings if needed before allowing further use of the software. So as Doomseeker suggests, lets check the settings! Engines category houses supported Doom port engines that Doomseeker can support. However, as Doomseeker itself has no dedicated engine embedded, it relies merely by plugins in order to function properly with another Doom port. As Doomseeker utilizes the plugin system in-order to operate and function with another Doom port, this can offer Doomseeker the option of escalating or dwindle on what Doom ports that can be supported. For example, it is possible to easily expunge three plugins or include five new plugins regarding other various Doom engines, and Doomseeker will automatically support the changes. Doomseeker Engine preference for SkullTag. A direct path to the 'zandronum' executable binary program. Input commandline parameters that is designed for Zandronum when the binary is invoked by Doomseeker. 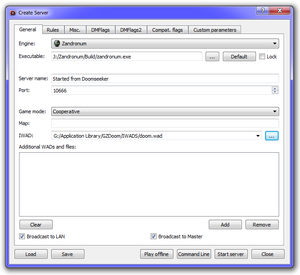 The master server is a dedicated host that tells Doomseeker (or any other server browser client) what game servers is broadcasted to the public. Unless told otherwise or altering to another master server address, do not edit this field. When set to True, Doomseeker will automatically try to fetch the exact Zandronum alpha or beta build release that matches the game server that the user wishes to connect too. When 'Testing Release' is set to True, the user can specify a location to place the downloaded alpha or beta builds within the clients filesystem. It is recommended to place a new directory dedicated for the testing binary within the parent Zandronum directory. Doomseeker has some available options to allow the user to modify the appearance within the general outlook. When a custom server is manually added by the user, the entire custom server row will be highlighted a different color. This can help separate the servers that were fetched from the master server(s) and servers that were manually added by the user. Enforce Doomseeker to ignore bots. When the user selects a server that is password protected from either connecting to the server or joining within the game, Doomseeker will prompt the user to enter a password in a dialog box. When 'Hide Passwords' is true, the password entered by the user will appear as bullets or stars. However, if 'Hide Passwords' is false, the key can be read normally. If true, Doomseeker will appear on the users tray icon. When close button is pressed, minimize to tray icon. When true, Doomseeker will completely minimize to the users 'notification area' and will not appear on the taskbar. Two custom servers were manually inputted to find these two hidden servers. Custom servers provides additional servers to be shown that are either private or generally not available by the master server. This option allows users to manually input the game servers entire address and have Doomseeker communicate to the game server directly. However, the entire address must be a direct address and must not contain any ranges. For example, if the game server address is '192.168.5.98' and has three servers that is not broadcasting to the master server or within the LAN, the user must input three addresses with '192.168.5.98' and the exact port numbers. In addition, it is possible to input DNS addresses for custom servers. If the DNS for the Zandronum game server is "www.ThisIsStillAFakeAddress.NotReal.com", Doomseeker can translate the DNS address to the appropriate IP address automatically. But, however, the port number must still be accurate with that server. 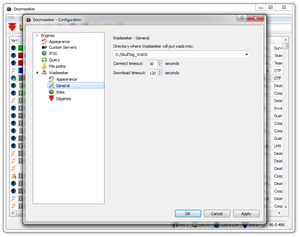 When the user attempts to access a game server, Doomseeker checks the file paths specified to find the necessary WAD (or equivalent) files necessary to connect to a game server. As a result, this is important that Doomseeker uses the correct directory paths. If the WAD files are in the correct paths then no configuration is necessary; but, however, if the directory paths are not correct, please update paths before continuing any further. To help avoid redundancy and to keep organized, the user can enforce Doomseeker to look for the WAD files in directory that will be equal for all users and that can be easy to up-keep. As of Windows® 6.0 and later versions of Windows®, applications are no longer allowed to alter the 'Program Files' directory. As a result, applications save and update the configuration settings in to the users Home Folder within a dedicated and usually hidden directory. Consequently, if their exists more than one user account within the Windows® operating system can cause massive redundancy by downloading the same exact WAD files from one account and again to another account. Besides using the users Home Folder, place all the WAD files into a new directory, for example, "C:\Zandronum_WADS". As all the WAD files are in this directory, all users should have complete access to this directory and can be managed and utilized by all users. As a result, This will help to avoid redundancy and and should not waste any space within the filesystem. WADSeeker enforced to put newly downloaded files to the specified directory. WADSeeker is an essential tool which downloads any new WAD files for the clients. However, WADSeeker is only good when the file can be downloaded. At rare occasions, there will be either a server or several servers that have a WAD file that can not be downloaded with WADSeeker. Such occasions are means of the WAD file(s) were never released yet, or that the file was uploaded at a location that is not compatible with WADSeeker. Moreover, when WADSeeker obtains the files, it has to put the files at a directory that Doomseeker uses. Please make sure that WADSeeker places the newly obtained files at the correct directory path as Doomseeker uses. Doomseekers normal view when populated with servers via Master Server. Retrieve all servers that are available and are being broadcasted to the Master Server. Refresh the servers that are only on the clients server list. Allow the user to create a personal server. Open WADSeeker and download a new file. Note: Clicking on a server that utilizes a file that the user does not already possess, WADSeeker will automatically search for the file for the user. View previous games and events by playing a previously recorded demo. When pressed, Doomseeker will record a demo while the user is playing on a server. View friends that are currently playing or update the buddy manager. View Doomseeker's output Log. View every task that Doomseeker is doing and how. Chat with other Zandro-Players on IRC! Enforce Doomseeker to only display specific servers by filtering only servers that meet the appropriate conditions. Ping plays an important role on communication and game play. When any device communicates to another device, they send electronic signals to each other. Despite that this type of communication is fast to the naked eye, but depending on how far each device is from another it may cause latency. For example, if a client from Europe sends a message to a server that is located in Russia, it can take up to +/- one second for just one small transaction to be sent back and fourth. However, if both the client and the server are within the same region, the message would be received nearly instantly. As communication is important for instant transmission of data, location of both nodes can be a major cause of latency. This is the game servers direct address and port to the specific server. Doomseeker reports what the game server is utilizing and at what settings. IWAD file is an essential for any game. WADS is additional game files that is utilized within the virtual world. Map is merely the current running level within the game server. Game Modes is a specific set of rules and environment settings within the virtual world. WADSeeker downloading two WAD files by request from the user. 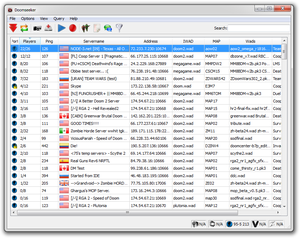 WADSeeker, as part of Doomseeker, is designed to automatically download the requested WAD files for the user when either requested or before connecting to a game server. WADSeeker will automatically scan through several sites that is available on the internet to find the right files that the user is wanting. But, however, Doomseeker may not be compatible with some sites that request user input within the website or utilizes human verification challenge, such as CAPTCHA. 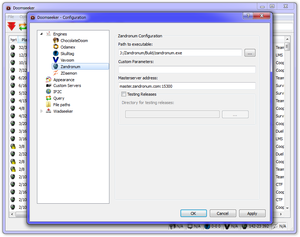 Doomseeker has the capability to manage the user's stored demos that was recorded by Zandronum, and even play the demos with the appropriate engine. Make a duplicate of the demo to another desired location. If trying to play recordings that was not managed by Doomseeker, be sure that the format is adjacent to the one below. Otherwise, if the formatting is not correct, Doomseeker may not properly pass the right arguments to the specified port engine and could cause some abnormal behavior. As Zandronum supports demo recording, Doomseeker can invoke the command automatically for the user and will most likely ever need not worry about latency within the virtual world. As the demo's are in ZDoom format, the demos can not be read by any other software but what it was recorded with, thus Zandronum. To automatically start recording games, just toggle the 'record' icon. Note: If you are wanting to post demos on video streaming sites such as 'Youtube' for any reason, it could be best to first utilize Zandronum's recording functionality and then play back the demo while recording in any desired format. This should cut-out the intensive processing while playing any game and the playback recording can be in any quality that is plausible depending on the system resources and hardware available. Use a direct pin-point name to the user, but have the availability to use a wildcard metacharacter. Use the flexibility of Regular Expression. To view what buddies are online, just refer to the list which houses who is online and at what game server. Doomseeker logs every command that it passes and even reports what game servers disallowed a response from the client and if the master server responded correctly or not. This is primarily useful for debugging or checking wither the client was banned from the master server or game servers. 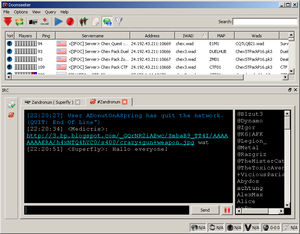 Internet Relay Chat or IRC is a simple way to communicate with other users around the world. Zandronum has IRC support for its players to communicated with each other and talk about matches, events, or even general chatter. This allows the user to filter the presented game server listing provided in Doomseeker. When utilizing the filter options, the changes take effect immediately, thus, Doomseeker will modify the list that it initially provided for the user to a customized list. To undo the changes is to clear each field. Notes: Metacharacters and RegExp is not supported within this section. Sort out the 'game server name' with what is typed in the field. "Armada" will only show the servers that contain 'Armada' within the game servers name. Only display game servers that the ping is equal or less than what the user requests, any game server's ping is greater than what the user requests - the server will not be displayed. To reset this to default, use the zero integer. Only display game servers that contains the keyword that the user requests, this is adjacent to Server Name. This not only includes the 'WADs' column, but also the 'IWAD' column. Only display game servers that are hosting a specific gamemode by a keyword. Display game servers that are already full? Display game servers that are empty? Only display game servers that are responding normally and hide all servers that are not responding. Doomseeker has the capability for the user to create a personal game server at whatever settings and whatever WAD files. Below is just a general outlook definition of the available options in Doomseeker. Specify the Doom port engine that will be used for hosting the game server. Direct path to the executable that will be used for processing the game server. The name of the game server that will be publicly advertised. Specify a specific port that the game server should utilize. Normally, this requires no alteration, unless there is specific rules within the firewall and NAT traffic rules. Setup a specific set of rules within the virtual world. Specify which map name to start when the game server successfully starts. Specify which IWAD to utilize within the game server. Note: It is not possible to start a game server without an IWAD! Add PWAD(s) and equivalent to the game server. Keep in mind that when hosting a game server publicly, other users will need to find the extra files in order to connect to the game server. Advertise the server within the Local Area Network. Publicly advertise the server to the master server. Zandronum allows the capability of enforcing what maps can be played. To utilize this feature, input the mapnames. Once the maplist has been exhausted, Zandronum will restart the maplist by going back to the start of the list. When the maplist is utilized, it is possible to have Zandronum completely pick which maps to be played in a randomize sequential order. The maps should never be called more than once, that is, unless, the maplist has been exhausted and restarting. Defines the difficulty rules within the virtual world. Specifies what game modifier to be utilized. How many lives each player has within a specific game mode. Direct location within the internet that the users can download the extra files utilized within the game server. A publicly announced email address. Ideally, this is used mainly for the users to contact the server administrators. Enforce users to have the exact key before the client successfully connects to the game server. Enforce users to have the exact key in order to play within the virtual world. When set, allow those that know this key to remotely take control of the server. This allows anyone with the right key to pass any command desired to the game server remotely. MOTD or Message of the Day, merely a message that prints on the users screen immediately when they successfully connect to the server. This message only remains for a few seconds. As the Flag settings and custom parameters are always subjected to change over time, it is best to link to a centralized page that covers each of the flags and parameters. This page was last modified on 21 August 2016, at 09:59.